A prom proposal by a Vandegrift High School student on Snapchat used a 'slavery pun,' according to the Vandegrift High School principal. A prom proposal by a Vandegrift High School student has led to some controversy. The proposal was sent on Snapchat and showed a student holding a sign that read, "If I was black I'd be picking cotton, but I'm white so I'm picking U 4 Prom." Vandegrift High School student posts "slavery pun" on Snapchat as part of prom proposal. We strive to make VHS a welcoming, inclusive environment for all. A big part of that endeavor is educating our students about cultural awareness and sensitivity. In the case of social media, we have a process to investigate, assess and respond to social media posts that may disrupt the school environment. Students alerted us about a current VHS student posting a “slavery pun” on Snapchat as part of his prom proposal. We immediately began an investigation to determine the facts and impact of this incident. We do not tolerate or permit discrimination or hate speech of any kind at Vandegrift. A preliminary investigation suggests the student intended the posting to be a humorous reenactment of a 2018 meme that garnered national attention. There is absolutely nothing humorous about slavery, and its use in this context goes against the values and ethical principles we teach. 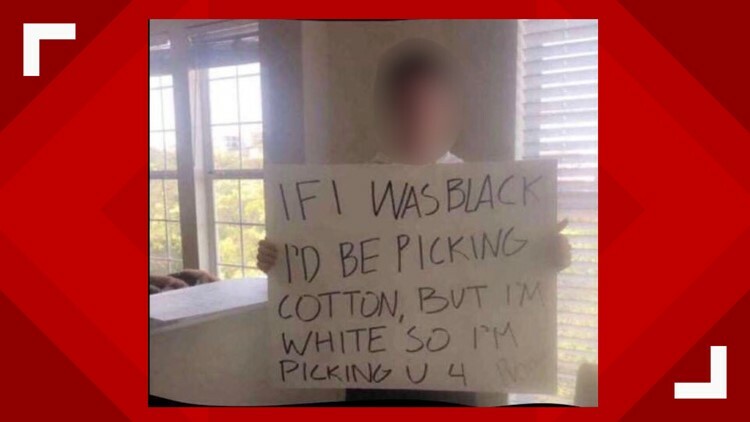 While inappropriate and disturbing, the student did not direct this unacceptable message at a particular individual with the intent to harass, bully or discriminate. Despite its intent, we will continue to address the extensive concern this post caused our students, teachers, staff and families who take pride in the inclusive culture of our campus. We are working within our Student Code of Conduct to apply appropriate discipline with the individual student. We ask that the privacy of this student be respected during this process. Please take this opportunity to discuss with your student(s) the importance of responsible digital citizenship and respect for others. If your student has additional concerns or has experienced any discrimination resulting from this post, please refer them to our administrative team or their school counselor so we can provide the appropriate support. I am extremely grateful for the individuals who were proactive and shared this concern with us so we could promptly investigate the issue and involve the appropriate authorities. Thank you for your continued support of Vandegrift High School. In the letter, Little said they launched an investigation into the incident and found that while the post was inappropriate and disturbing, the message was not sent with the intent to harass, bully or discriminate. The investigation by the school found that the student intended to make the post a reenactment of a 2018 meme that brought national attention when a Sarasota Florida teen did something similar. Little said that appropriate discipline will be applied to the student that sent the post. Zipporah Robinson, a junior at Vandegrift, told KVUE she was shocked to see the photo on her phone. "When I saw it, I had to double take to make sure I was looking at the right thing," she said. "And when I saw what he was doing, I was just embarrassed and humiliated because it really hurt my feelings." Zipporah said she doesn't personally know the student, but she hopes he learns from this experience. "That's not a fun or cute prom proposal. That was just hurtful and demeaning," she said. "I really feel like he was being ignorant. It definitely was. I don't know if he meant to be racist or not, but it was." The Vandegrift High School prom is May 18.